It’s a revelation: ICE CREAM CREAMER. But wait, first, remember when I used to hate coffee? I am so glad I forced it on myself so I could be cool like you guys. Now we can go to coffee shops and hang out and drink it! Or stare at our phones while simultaneously holding exciting conversation. Is that an oxymoronic idea? 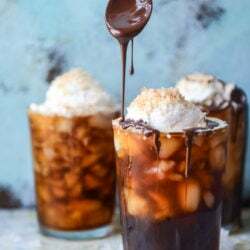 I’ve been dying to make some coffee soda after my friend Cindy shared this kahlua coffee soda back in June. Ugh! Do you see how fabulous that looks? I wish I had it in front of me right now like no other. So! I wanted to try a version out for myself. I made some cold brew and let it sit for about 24 hours. But right before pouring it over crushed ice, I added in 2 shots of espresso (just made from my nespresso) so it was extra strong. I didn’t want it to be totally watered down and I also haven’t slept in roughly 570 days, give or take a few. It was necessary. Also, since I knew that some soda was going to make it’s way in that glass, it needed to be jolt-your-socks-off strong. Bingo. And then! A big fat scoop of ice cream right on top. Living and dying for this coffee with ice cream creamer at the moment. I wish that I could have it in my coffee every single morning. I probably could right? I mean, I guess if I wanted to forgo every other indulgence throughout the week. And it might just lead to an ice cream cone for second breakfast? But I see zero problem with that. On the top: some melted chocolate + coconut oil drizzle for some extra fanciness. A few toasted coconut shreds because I can’t stop. The coffee is so cold that the ice cream doesn’t melt quickly, so you can scoop those coconut crusted ice cream spoon bites right from the top. Then push the ice cream down and swirl it all around. And drink four of them. Oops? The next morning, strain the coffee through a few layers of cheesecloth or a coffee filter. It’s key to reduce the granules. Fill a glass with crushed ice or coffee ice cubes (or omg, mind blown – crushed coffee ice cubes?) and pour your cold brew overtop, a little more than halfway. Add in the two shots of espresso. Add in the club soda and stir. Taste and see if it’s bubbly enough for you – if not, add a touch more! Scoop the ice cream on top and slightly push it down into the cold brew. At this point, you can drink it like this or swirl the ice cream until it melts. Or you can drizzle on a little chocolate and sprinkle some coconut! Ah the bubbliness…that just makes this over the top fantastic! I’ve been meaning to try a cold brew / soda combo for some time now …. this is amazing!!!! You’re a genius. Isn’t it crazy how people ‘hang out’ with each other and just stare at their phones?! I know I’m completely guilty of this as well, but sometimes I just wanna yell at people to put down their phones and talk to each other! Or at least put down your phone for a hot second and enjoy this INSANE cold brew. I’ll take ice cream in my coffee all day, errday. Yeah, if it’s coffee I’ll take it! And this looks soooo good! I still have not tried a coffee soda and now I really feel like I’m missing out!! This sounds SO GOOD!!! Did you ever go to Quiet Storm here in Pitt before they closed a year or 2 ago? They were where Spork is now..anyways they had this amazing Root Down drink– root beer float with 2 shots of espresso in it. Sounds so wrong but it was SO GOOD. oh no I didn’t and now i feel so DEPRIVED! how did i miss that?! ooh, this sounds like the perfect summery, fizzy version of affogato (which i just had last week for the first time and loved!). YES! Ice cream creamer, where have you been all my life?! OMG Jessica, you have done it again! Im on such a huge cold coffee kick. This looks so decadent! Yum! I’ll have one for breakfast. Thanks! OMG YES!!! Ice cream as coffee creamer NEEDS to be a thing asap!!! Ice cream in your coffee IS delicious! I was running late the other day after making a cold brew iced mocha and realized we were completely out of ice (thanks, boyfriend). I used a scoop of vanilla ice cream as my ice and creamer and it was heavenly. My last payment was $8482 working 11 hours a week online. My sisters friend has been averaging 17k for months now and she works about 21 hours a week. I can’t believve how easy it was once I tried it out. Thanks for this Recipe. I am so glad that finally i will try some good flavor in my cold coffee. I will definitely going to try this. This is amazing. I am a coffee lover and thanks for giving me some variations in it. Now at last my tongue will get something good. Going to try this on this weekend. Yea that’s great actually I am also try this one one this weekend. Pingback: 9 irresistible ice cream float recipes. Because summer's not over yet! Really Awesome article, I love coffee very much. Nice recipe. Thanks for your contributions for us. I do keep mixture overnight in the fridge. It is the best way for me. Jessi, you learned me new things to do! I never knew it, and i must try it today…. Well, I am here waiting for summer to come. It’s snowing and freezing outside but and I’d really want one of these drinks. Looks fantastic. Hey Jessica, I am a coffee lover guy. Coffee makes me always fresh and your coffee and ice cream combination; its really awesome! I really like your article. Thanks! Wow, this brewing company/project seems extremely amazing and beautiful! I wish I could be a part. I always wanted to start up my own. It was one of my dream. Hye great work done by you, love the way you presented it. I never knew it, learned new things. Hye, great work done by you. amazingly presented and learned new things i never knew. 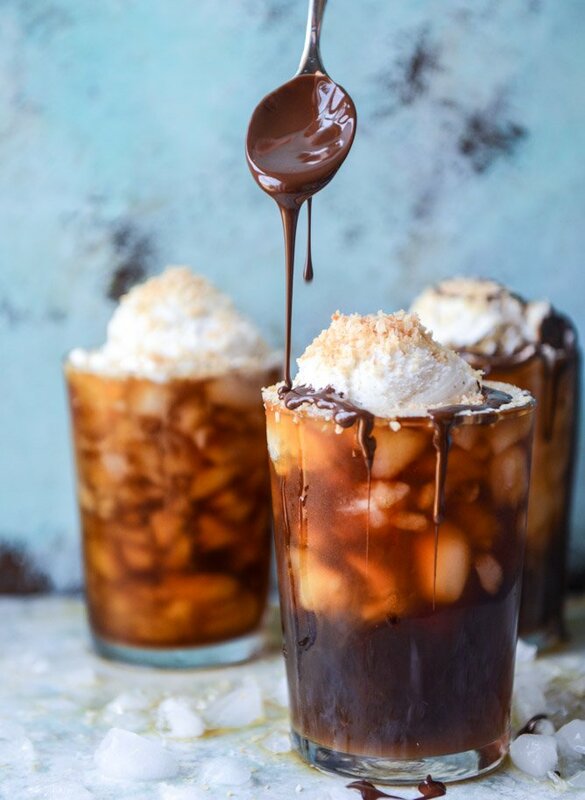 It’s getting hot here and this amazing refreshing coffee cooler float is all I need. Thanks for sharing. Ohhhhhh very nice i like to drinking coffee, and i like to reading coffee related blog and article thanks and this best combination of cold brew coffee and soda floats. Thanks for sharing this, I love the coffee makers, i usually sip in before bedtime and at work! it helps a lot! and these machines make it even easier! I love this cold coffee! Looks so hearty & satisfying, can’t wait to try it! 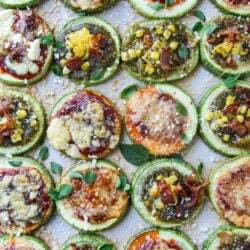 This recipe is good to try because the taste seems to be funny and awesome. Thanks.